In 2015 Knutsford & District Lions linked up with the Citizen's Advice Bureau (CAB) and the Knutsford Guardian newspaper, in a bid to greatly reduce fuel debt in Knutsford and the surrounding areas. 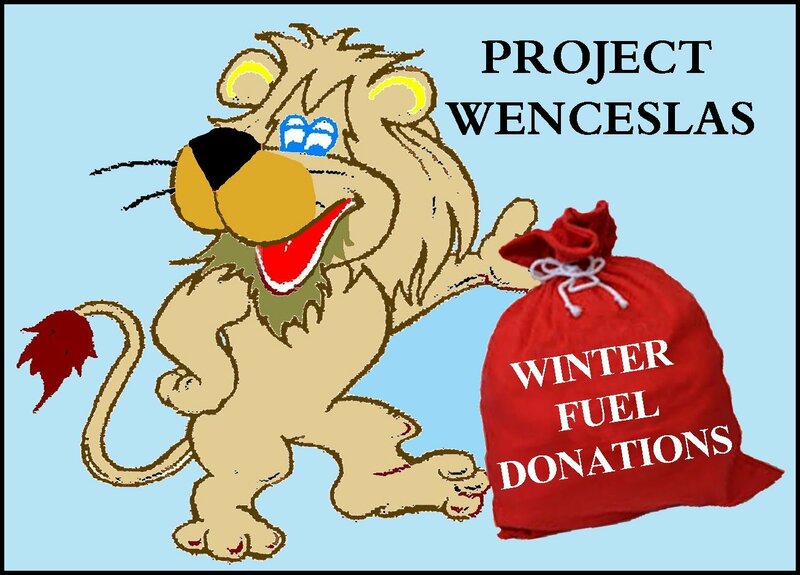 Through an ongoing appeal entitled 'Project Wenceslas', we encourage local senior citizens who feel they do not really need all of their Winter Fuel Allowance to make a donation to help local families/individuals of all ages who are trapped in fuel poverty. We also welcome donations from anyone else who would like to support this appeal. All donations are ring-fenced for 'Project Wenceslas', and payments are made direct to the fuel utility accounts of the affected households, as identified via CAB - to ensure that all of the money is used for the purpose for which it is intended. Donations can be made via our Just Giving account. Alternatively send a cheque payable to 'Knutsford Lions Charity Account' (marked 'Project Wenceslas' on the back) to Knutsford and District Lions, c/o Peter Willgoose, Chestnut Cottage, Tabley Road, Knutsford WA16 0NE. If the cheque is from a tax payer we should be able to claim Gift Aid, which will increase the donation by 25% - Gift Aid form available on request. In November 2014 Knutsford Lions, in collaboration with the Knutsford Town Council, launched a Lions Young Leaders in Service Award Scheme. The Awards recognise young people between the ages of 11 and 18 giving service to the local community within a 12 month period. Each individual is issued with a small Log Book in which to record their activities. Certificates (Silver for 50 hours, Gold for 100 hours) are presented jointly by the Town Council and Knutsford Lions at an Awards Ceremony each year. For more information see "How the Scheme Works" or Contact Us. For over 30 years Knutsford Lions have been providing lunch for between 30 and 40 people who would otherwise have been on their own on Christmas Day. We provide transport and a traditional christmas lunch. The Town Mayor attends and chats to our guests, and their is a visit from a friendly Santa with gifts. We end with some carol singing, which had a particularly good lead scratch choir in 2012 (see picture)! Message in a Bottle is a free scheme set up in the UK by Lions to help the emergency services by providing a known location for essential information in the event of an accident or sudden illness - particularly for people living on their own. Each bottle is provided with a form to allow the essential information to be recorded (e.g. any key medical conditions, or medication issues and where tablets etc. are kept). This information is to be kept in the special bottle inside the fridge. Stickers are provided which should be displayed on the INSIDE of the front door (so that the emergency services know there is a bottle on the premises), and on the front of the fridge (so they know where to find it). Knutsford Lions hold a stock of bottles - if you would like one please contact us. Bottles are also available from the Manchester Road Medical Centre. With the support of other Lions Clubs in Cheshire East we also provide bottles to the Cheshire East Fire Safety Section. They offer bottles to people over 65, or with special medical conditions, as part of their home visit safety visits - over 9000 bottles have been handed out in this way since 2008. With the help of Optometrist Wendy Diddams, Boots Opticians, Knutsford Heritage Centre and members of the public, we have been collecting used spectacles for a number of years. Each year we send about 3000 pairs of spectacles to the Lions Club of Chichester, where they are checked, sorted and then sent on to Medico France who supply them to Eye Camps in Africa, India and Eastern Europe. Help with marshalling at local events - In recent years we have become regular providers of marshals at a number of local events, in particular - marshalling along the reindeer route prior to the Christmas Lights Switch On (for Knutsford Town Council) and the annual National Play Day Event on the Moor (for Friends of the Moor). - In November 2014 we launched a "Young Leaders in Service" Award scheme. - We participate in the annual Town Council award of a Millennium Bursary, open to local undergraduates. - We make grants to young individuals who embark on organised overseas travel projects. - We have a rota to hear children read each week at a local Primary School.